Ease of doing business is the annual report published by World Bank. The report ranks countries that are best suitable to start a new business. For example, in the recent ease of doing business report, New Zealand stands in firsts that means, compared to other countries New Zealand has more suitable environment to start a new business. Ease of doing index gives rankings for 190 countries by comparing 10 indicators that are necessary to start a business. The ease of doing business measures regulations directly affecting businesses like clearances, supply of electricity etc. In 2017 report India makes highest-ever jump to rank 100 out of 190 countries. With this year's performance, India became the first ever country to record highest jump in World Bank's ease of doing business ranking. Bhutan, in 75th place, is South Asia’s highest-ranked economy, followed by India (at 100) and Nepal (at 105). What is the rank of India in Ease of doing business? Which of the following organisation publishes Ease of doing business report? Which country stands first in the recently released Ease of doing business report? 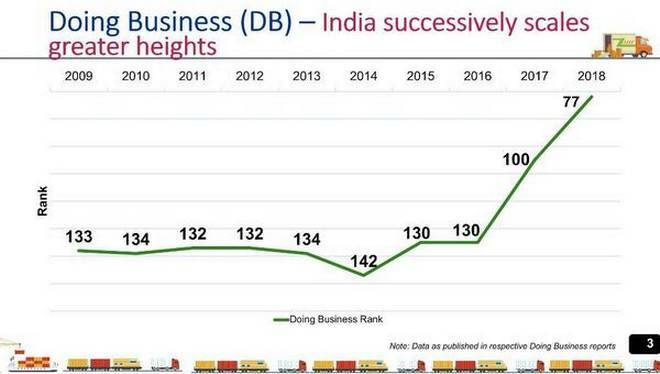 Rank of India in Ease of doing business-2019 is 77, what is the rank of India in Ease of doing business-2018?